The West has formed a political-military coalition that does not include Russia; China, a fiercely insular country has a historical wariness of building alliances. This forces Russia into a position of severe self-reliance and pragmatism. Whether Russians believe in their greatness or not, however, may be beside the point. Today, more than ever before, the country has been placed in a situation where it must rely on its own resources – and resourcefulness – to maintain its position as a global centre of power. Indeed, there seems to be no other option. Due to its vast geographical size, many Europeans fear that admitting Russia into the European Union would obliterate the influence that the 27 members states now enjoys on the global stage. At the same time, however, it cannot be denied that Russian pride precludes it from becoming just another quasi-national, perpetually-dependent appendage of bureaucratic Brussels. NATO is certainly another roadblock to bilateral cooperation between Russia and the West. The military bloc, which many Russians see as an archaic relic of the Cold War that should be scrapped like a decommissioned tank, has no intention of truly cooperating with Moscow. This has been proven by the US and NATO’s ambitious project to construct a missile defence shield in former Warsaw Pact real estate. Not only does the West refuse to allow Russia to cooperate with them on the project, it flat out refuses to provide so much as a written statement that the system will not, in some hypothetical future scenario, be aimed at Russian territory. This has led many Russian observers to conclude that the distant American tail is wagging the NATO dog. “NATO is a union whose members are formally equal, but, as George Orwell put it in his book Animal Farm, ‘All animals are equal, but some are more equal than others’," the parliamentarian said. The unnecessary tension that the missile defence standoff has placed on Russia-West relations is what the Cuban Missile Crisis was for the past generation. The only difference is that the US system is being sold as a “shield,” not as a militarily destabilising element that is capable of freeing the sword (missiles) from its sheath. Taken in this light, the “reset” was nothing more than a cunning program designed to make Russia drop its guard. Moscow, however, was not fooled and there is no need to wait for future historians to tell us what is already obvious: the arms race is on. President Putin has made defence spending one of his major priorities (despite warnings by economists that growing military expenditures could undermine the country’s budget). Expenditures for defence spending in 2012 are estimated at 677 billion roubles (about US$21 billion). Between 2011 and 2020, the Russian Defence Ministry is committed to upgrading 70 percent of its weapons and developing modern precision systems. All told, it is projected that Russia will spend some 23 trillion roubles (about US$ 718 billion) modernizing its military over the next decade. Those who may gasp at that enormous number should consider why Russia is on a spending spree. It has been estimated that the United States already spends close to US$ 1 trillion per year on its military industrial complex, which has grown to such dimensions that neither the Democrats nor the Republicans have any idea how to tame this runaway Frankenstein’s monster. Naturally, other countries not on Washington’s Christmas card list are seriously alarmed by these developments. It does not help either that the man who could possibly replace US President Barack Obama, the Republican challenger Mitt Romney, has gone on record as calling Russia “our number one geopolitical foe.” Needless to say, Russia is not going to wait for any polling results before it makes a decision. Even if Obama wins in November, Moscow will still have to contend with the possibility of another fire-breathing politician – another Neocon? – in four years time. Meanwhile, the situation to the East, while not nearly as ominous as in the West, largely provides Russia with little more than business opportunities based on natural resources. 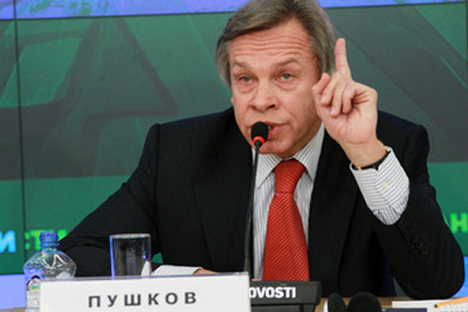 Pushkov, the Foreign Affairs Committee chairman, also discounted chances of Russia forging military-political unions in the East. “True, our relations are close, we have strategic partnership and we are allies in a number of fields, but we will hardly formalize the partnership with a special treaty, at least in the near future," Pushkov concluded. This situation places Russia, situated as it is between East and West, in the position of relying on itself as opposed to any alliances for guaranteeing its future security.